WASHINGTON, December 24. /TASS/. 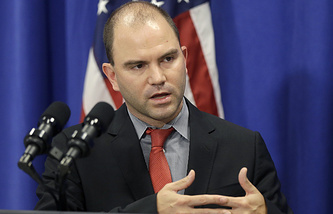 When the US and Russia work together, it is easier to resolve major global problems, Ben Rhodes, deputy national security adviser for strategic communication for the US President said in an exclusive interview with TASS. "It has always been our policy that it is better when the US and Russia can work together," Rhodes said. "It is easier to resolve difficult global issues." "We do believe that there are interests that we have in common like fighting terrorism," he said, adding that the two countries "continue to have some important differences, first, with respect to Ukraine," and on Syria. "I would say actually that the best thing that happened in US-Russian relations this year was the Iran deal," Rhodes said. "We would not have achieved the Iran deal without cooperation between the US and Russia, both on sanctions and on diplomacy," he said. "Russia is playing an important role in the implementation of the Iran deal." "So, I think the Iran deal demonstrates what can be done when we do work together," Rhodes said. Some political experts in Moscow consider the upcoming year to be wasted for the US-Russian relations and harmful to the Russian interests as it will be election year in the US and the year of the NATO summit in Warsaw. Rhodes said 2016 will be the one "in which we see Russia and the US work through our differences, but that will require follow-through on Minsk and will require many more common grounds on Syria." "Again I think that the relationships between the US and Russia are so important to both our countries and the world that even as you will inevitably have flare-ups in rhetoric, we are going to make our judgements based on what actions are being taken, what progress we are able to make, recognizing that there is always high rhetoric in the political environment," Rhodes said.